Negligent. Overdue. Incomplete. Non-compliant. Mis-categorized. Undervalued. Expired. Uncontrolled. Insufficient. Totaled. Unmonitored. Risk is why insurance sells. Probability isn't polite. Losses don't hand out annual strategic proposals. But risk is more than a term for corporate uneasiness. Colleagues and customers can lose confidence, too. Businesses are sent hobbling. Some companies close their doors. Unsure of your risks? Underwhelmed by your current protections? Reeling from losses? 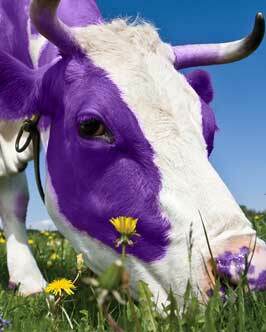 We're a purple cow, a uniquely proactive risk-management partner focused on your profitability. Insurance as we see it can actually make you better. After all, reducing risk is the right thing to do, and your premium is a big slice of your profitability. Your happier, healthier employees create a better workplace and community. Insurers want you, even dangling better rates to compete for your business. People see your stability and trust you with their own. Your balance sheet looks better so your financial institutions give you due credit. Our clients enjoy these results year after year. We've been open since 1984 and have clients of 10, 20 and 25 years. Managing risk is a full-time job, but most mid-size companies simply can't afford to add another department to the payroll. When you hire us as your insurance advisors, our staff is your staff, remote and onsite. Seamless. It's our business to know the risks that affect your industry. We not only let you know if you're cruisin' for a bruisin', we develop turnaround plans and set up time-tested ways of tracking improvements and changes together. We've developed programs and spot on coverage for major industries like trucking, mining, healthcare and construction. We've grounded business operations in HR and benefits programs that do right by employees and regulations, staying free of fines and softening suits. We're setting new industry standards so that you can, too.